I approach Charles Gatebe and Scott Janz in the hallway. I wave hello to Charles and ask, "You get your stuff back?" "Yeah, I got it back." "Oh, good. You know when you're coming in?" macaronic (mack'-uh-ronn'-ick) adj. 1. involving or characterized by a mixture of languages, especially burlesque verse in which real or coined words from two or more languages are mixed or vernacular words of modern language/s are Latinized and mixed with Latin words and hybrid forms 2. having the nature of a medley; mixed; jumbled. seems to mean "director's stretch"
Sorry, no review... Daddy-O hasn't been able to watch anything since Tuesday except footage of planes crashing and buildings collapsing. He wishes they were just movies with very realistic special effects. "[Here's] how to get people to buy Fluxx with so many other games sitting around: don't tell them about it. If you do that, they'll smile, nod, and move on. Just play the thing. After five minutes they're hooked and suddenly realize they can't live without it. Yeah, all this is rampant braggadocio but when something goes right sometimes you have to shout it from the rooftops." -- JK Grence, on the Rabbit mailing list, talking about how his manager at Game Daze in Tucson gave him a good performance review with the comments "AWESOME at selling Fluxx and other cool card games!" Of course, the top story here is the same as it is everywhere... like most people, we've just been watching the coverage with stunned disbelief, feeling sad about the victims and worrying about the future. How will this most horrible of events impact us all? What new violence will this violence beget? What must it have been like to have been on-board one of those planes, or after the crashes, on an upper floor inside one of the towers? The mind reels. I can't fully describe all the feelings and emotions this has generated, but I guess I don't really have to, since I know you're feeling them all as well. It's been two years now since we re-published the Icehouse set, and the four games we currently include with the pieces now seem woefully inadequate. Some of our favorite Icehouse games, such as Zendo, RAMbots, and Volcano, hadn't even been invented yet when we put together the current rulebooks, and we've got a long list of changes to make to the rules for the games we did include. In particular, the old favorite Zarcana has been re-designed so completely that it had to be renamed Gnostica. So, we've decided to publish a new rulebook to accompany the pieces, which will contain more than twice as many games as the current edition, conveniently bound into a single volume. This plan has been on the Stove for a long while, but it's finally starting to come to a boil. The working title of this book has long been "9 Games for 60 Pyramids", but we've come to realize this title is flawed. We'd really like this book to include Volcano, which is disqualified because it requires 80 pyramids. More importantly, several of the games on the proposed contents list can be played with fewer than 60 pyramids, and since we'll soon be selling Icehouse pieces by the stash tube, we don't want consumers to feel like the book has nothing to offer them if they buy fewer than 60 pyramids. So, we've decided on the new title "Eleven Icehouse Games." But what shall be the Eleven Icehouse Games we include? Well, we've pretty much decided upon the first ten: IceTowers, Thin Ice, Zendo, Martian Chess, Volcano, RAMbots, Zagami, IceTraders, Icehouse, and Gnostica. This is an outstanding slate of games, each one thoroughly tested and known to be solid and fun, and collectively representing a wide range of game types and ways of using the pyramids. Each one is different from the next, and if you like games and you're drawn to the pyramids, you're bound to find something that appeals to you in this set. However, as I study this list of excellent games and ponder the styles they include, I see one glaring omission: a race game involving dice. Not one of these games makes use of dice! The collection still needs a strategy game with a strong luck factor, something that two people could play together for years, with both players winning and losing some games, even if the two players aren't well matched. You know, something to rival backgammon. More than a decade ago, when Icehouse was strictly an imaginary game, I said it had come to rival chess and backgammon as the standard board game for intellectual competition. Well, we have a vaguely chess-like game on this list, and several games use a chessboard... but where's the backgammon-style game? Looking through the S.L.I.C.K., we see a number of possible contenders. The most obvious ones are Kotra, by Glenn Overby, and IceGammon, by Ron Hale-Evans. In the introductions to both of these games, the designers express a desire to call their games "Martian Backgammon", but found other names after seeing that Eric Zuckerman was intending to publish a game under that name, something he still has yet to do. Then there's Dan Efran's Martian Frisby, and Kristin's Blockade, and probably other games as well, which could be described as Martian Backgammon. The question is, are any of these games worthy of having that title? I must admit I haven't tried playing them all. As I thought about all of this, very late on Friday night, I decided upon some additional criteria. First, this game should require only 30 pyramids. Having decided against the "60 pyramids" title, I'm now very interested in games that can be played with a minimum of stashes. Secondly, it should ideally require nothing else other than dice. While I would like for this game to have enough of the feel of backgammon to make the name Martian Backgammon appropriate, I don't want to go as far as IceGammon in requiring an actual backgammon board. I would also like to avoid even using a standard chessboard if we can, since we've already got a lot of chessboard games on the list, and it just won't seem very much like backgammon if it's played on a chessboard. Sometime after 4 am that night, I decided I needed to just design this game myself, and started tinkering around with pyramids. By the time Kristin got up in the morning, I was ready to playtest something with her... but it totally didn't work. I gave up and went to bed, but Kristin got into the challenge I'd presented, and by the time I woke up that afternoon, she had designed a game that met my criteria! She'd been playtesting it all day with Alison, and after playing it myself, I had to agree it was pretty darned good. Already it has my vote for the Eleventh Icehouse game, but as always we're interested in knowing what other people think. 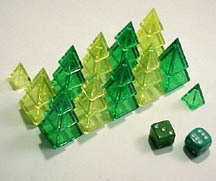 Are there any other race games involving dice and Icehouse pieces that we should be considering? I've already written up the rules for Kristin's Martian Backgammon... if you've got 2 Icehouse stashes, 2 dice, and 2 players, please give it a try! I was sad last week because my classic old Mac SE, which I've been using as a glorified typewriter, refused to reboot. But since then, I've switched to a vintage Powerbook, which I was given by Kerin Schiesser while we were visiting California. At the time, I wasn't quite sure how to make use of it, but now it's my new writing computer. Thanks again Kerin!